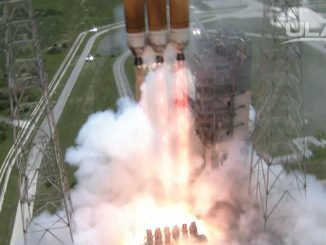 Departing on three pillars of fire, the United Launch Alliance Delta 4-Heavy rocket lifted off at 1:51 p.m. from Cape Canaveral for a classified national security satellite deployment. 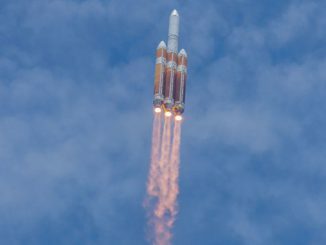 The United Launch Alliance Delta 4-Heavy rocket fired away from Cape Canaveral at 1:51 p.m. EDT today to deploy a covert surveillance satellite for the U.S. National Reconnaissance Office. 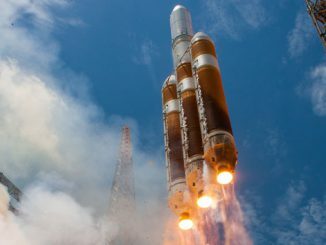 Two million pounds of firepower successfully launched a behemoth Delta 4-Heavy rocket and a top-secret eavesdropping surveillance satellite into space Saturday, embarking on a taxing climb directly into geosynchronous orbit 22,300 miles above the Earth to deploy one of the pinnacles of U.S. intelligence-gathering. 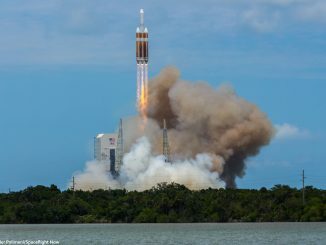 Members of the news media — reporters and photographers — witnessed the United Launch Alliance Delta 4-Heavy rocket lifted off from the ITL Causeway on Cape Canaveral Air Force Station, about 1.7 miles from the pad. 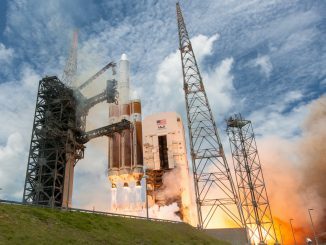 The United Launch Alliance Delta 4-Heavy rocket, standing 235 feet tall and weighing 1.6 million pounds fully fueled, unleashes 2.1 million pounds of thrust from the three RS-68A main engines at 1:51 p.m. EDT (1751 GMT) today to launch from Cape Canaveral on NROL-37. 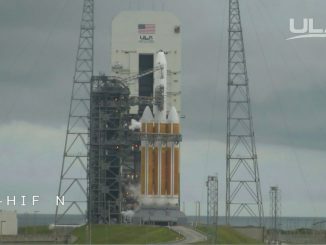 After being put back in position around the Delta 4-Heavy rocket after Thursday’s weather scrub, the 330-foot tall mobile service tower is retracted again at Cape Canaveral’s pad 37B for launch that will place the NROL-37 payload into Earth orbit. 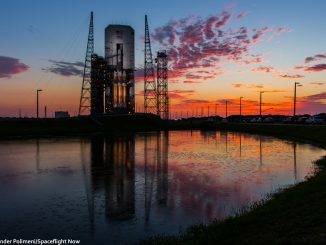 Narrated animation explains the United Launch Alliance Delta 4-Heavy rocket ascending to space with the NROL-37 mission for the National Reconnaissance Office through T+plus 6 minutes, 30 seconds before going into a news blackout. 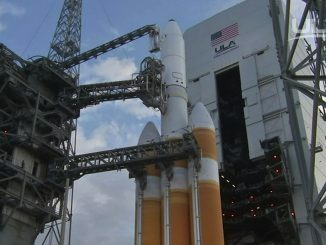 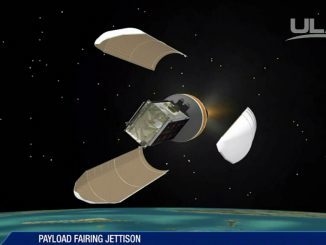 Narrated video packages show the shrouded NROL-37 payload being hoisted atop the United Launch Alliance Delta 4-Heavy rocket and the retraction of the mobile service gantry. 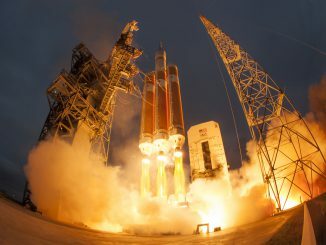 Giving every opportunity for the storm clouds to blow clear after a four-hour hold, the United Launch Alliance Delta 4-Heavy rocket counts down Thursday afternoon at Cape Canaveral until the clocks had to be halted for the day.